McCall Mixed Martial Arts has a mission - to foster a love for MMA in every single student. 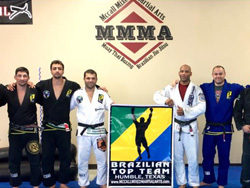 We offer Brazilian Jiu-Jitsu and Muay Thai Kickboxing to the greater Houston areas. We strive to provide our students with a safe, clean, positive and professional environment where they can feel comfortable while gaining expert instruction - all while they develop their techniques and skills that will affect them for the rest of their lives. We hope to have you discover a lifelong love for the sport of MMA! We also strive and aim to teach techniques that will help our students excel in self-defense and Martial Arts competitions. What is Mixed Martial Arts? As the name itself implies, Mixed Martial Arts (MMA) is a variety of different martial arts styles; it's a blend of martial arts, grappling styles, boxing, and wrestling. While the name "MMA" might make one think it's a new sport, there's evidence that a version of it was practiced amongst the ancient Greeks thousands of years ago. MMA differs from the traditional martial arts in the fact that it has a focus on both offense and defense. These forms blend different schools and martial arts style into one new different style. If you've ever watched competitive MMA matches, like UFC or something else, you know those fighters don't just focus on one style only. They strike, kick, grapple, wrestle, utilize punches and jabs, and standard holds. "I am married and we are the proud parents of five boys and one girl (including twins!). With eight members in our family, we know how valuable every dollar is, and we strive to make our programs very affordable. I began my grappling training in 1994 with Judo and I received my black belt in 1999. In 2000, I started training BJJ and received my black belt in 2007. Now, I'm a 2nd degree black belt in BJJ under 6th degree black belt Murilo Bustamante. I enjoy sharing my knowledge, enjoy watching others learn, and achieve their goals and dreams!" Don Mouser has been training in Brazilian Jiu-Jitsu since 1998. He is a technical practitioner that is over 225 lbs., but he moves like he is a middleweight. His knowledge of the game and flowing style has rubbed off on many students. "I started in MMA when a friend invited me to train Jiu-Jitsu. I was 16 years old and didn't even know what Jiu-Jitsu was at the time. I started training as a hobby, and later, after working on it as my hobby, it became my addiction and lifestyle! Now I would not know what to do if I couldn't teach and train the art that I love so much. It has become my life." If you're interested in strengthening your body, mind, and spirit with MMA classes taught by professional black belt instructors, contact McCall Mixed Martial Arts at (832) 375-9608. We proudly serve the greater Houston and Humble TX areas.